Joe Russo is in remission after treatments for the disease that was diagnosed in February. Joe Russo had one worry at his regular doctor visits. In late February, shortly after his 28th season as the Portland High boys’ basketball coach, Russo’s worst fear was realized. He’d been experiencing pain in his hip and jaw. Biopsies revealed he had non-Hodgkin Large B Cell Lymphoma. While his wife Donna and son Scott, an ER doctor at Mercy Hospital, asked questions and got details, Russo’s mind was a blur of what-if scenarios. Then at the very end of the meeting he heard, “This type of cancer is treatable and curable.” The competitive Russo, who had cut his basketball teeth on Munjoy Hill playgrounds, graduated from Portland High and starred at the University of Maine at Presque Isle, was stirred. “I said, ‘I’m ready to go. I want the treatment now,’ ” he said. Russo, 61, would find out beating cancer is possible, especially with support from family and a large group of friends, and being open to using a full range of treatment for both physical and emotional recovery. Russo was declared in remission in early October. He hopes a PET Scan scheduled for Dec. 3 will provide further confirmation of recovery. A 2018 inductee to the Maine Basketball Hall of Fame, Russo has won five state championships and 419 games. Practice for the new season starts Monday and Russo will be there, along with his longtime assistants Joe Giordano and Carmine Rumo, and part-time coach Joel Rogers. That was far from certain when Russo was inducted into the Hall of Fame on Aug. 19. At that time he was in the tail end of chemotherapy and other treatments. At the induction ceremony Russo had lost his hair and 30 pounds. Dark circles rimmed his eyes. 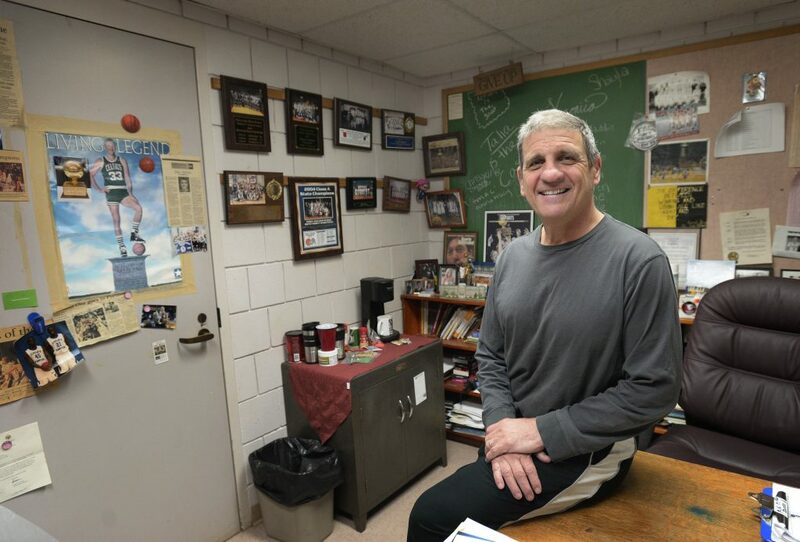 Late last week, in his memorabilia-stuffed basement office at Portland High, Joe Russo looked and sounded very much like the man who led the Bulldogs to a 76-8 record with three regional and two state titles over the past four seasons. When the school year started, Russo returned to his part-time position as a physical education teacher and girls’ volleyball coach at Portland. Russo and Rumo started the volleyball program a few years ago and the school said they couldn’t find a replacement coach for this fall, according to Russo. Rumo and parent-volunteer Peter Chadbourne took care of more of the volleyball responsibilities. Doctor’s visits, scans and fatigue kept Russo from attending some games and practices. At that time, Giordano and Rumo both said they fully expected Russo to be ready to coach basketball. Russo, however, wasn’t so certain. Russo’s current players wondered if they would have their coach back. Now Russo is both excited and a bit anxious about Monday’s practice. He wasn’t able to have his normal interaction with players over the summer. He would show up occasionally to summer league games, “just to visit. So they’d see me,” but left the coaching to Giordano and Rumo. As the treatments continued to show signs of recovery, Russo began to worry more about his mental state. He was finding it difficult to focus on tasks. “They call it a chemo fog,” he said. Worse, Russo recognized he was increasingly caught in a lethargic, apathetic mood. “Emotionally detached,” he described it. Visiting friends and family, having breakfast with buddies, traveling to a Boston Celtics game, weren’t worth the energy. “It was kind of scary to me when I was detached emotionally and things didn’t mean as much. I was scared I wasn’t going to get that back,” Russo said. Even after he had gotten the official medical word that he was in remission, Russo’s mental state didn’t improve immediately. Through sessions with counselors and attending lymphoma support groups at The Dempsey Center in South Portland, Russo learned his feelings were not uncommon. “I asked, ‘I’m in remission, I should be the happiest guy in the world, why am I not acting like it?’ They said it was like post-traumatic, now you’re realizing what you went through and what you were facing,” Russo said. He went to meditation classes and used acupuncture to help deal with stress. He spoke to priests and relied on his faith for spiritual healing. “Now with that training and support I’m feeling good. And what a relief,” Russo said. Throughout the process Russo always recognized the support he was receiving, from family, friends, fellow coaches and former players. Two Sundays ago, the Russo clan gathered at Joe and Donna’s house for dinner. “We had pasta, everybody came over, the first time I cooked sauce since February,” he said. Russo said there were many times over the past nine months when he had to do some self-coaching, to think, what would I say to one of my players having a tough time? He would remind himself to have a positive mindset, to keep working at recovery, “to fight it,” and to take a moment to appreciate the thousands of texts and emails offering support and prayers. Now Russo is in the position to return to coaching – and to help others.